Good for them. McDonald's restaurants have announced that they will start phasing out polystyrene cups due to increasing health and sustainability concerns. The vast majority of structural insulated panels - SIPs - use polystyrene foam insulation. Eco-Panels are entirely styrene-free, which is good according to a new report from the National Toxicology Program. McDonald's (MCD) has finally made a move to revolutionize its ubiquitous cup. It's testing ways to finally ditch the foamy polystyrene cups that have accompanied the company's McFare for ages. The material has several problems -- it's not commonly recycled, and its main component, styrene, has been labeled a likely carcinogen by the National Institutes of Health. And come on, foam is so old-school. McDonald's stopped using foam food containers for its products in 1990, but it has been slow in making similar progress with cups. And it's not like it would be that hard: Coffee giant Starbucks (SBUX) hasn't had trouble using paper cups in its business, after all. 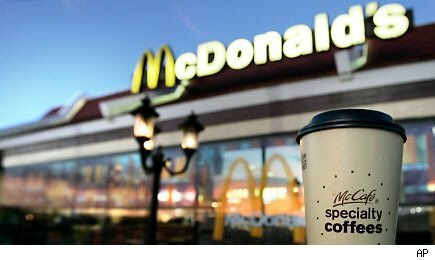 Mickey D's will test new paper cups in 2,000 (15%) of its stores. Because paper cups can be recycled, McDonald's could greatly reduce its volume of waste byproducts by using recyclable for the billions and billions served by the fast-food giant. These paper prototypes have another advantage. They will incorporate a "double-hulled" design to avoid an uncomfortable burning sensation from hot beverages. Of course, McDonald's is concerned about burns: Over the past few decades, the company's been subject to numerous lawsuits from patrons scorched by hot coffee, and news of the latest lawsuits lodged came out this week. McDonald's probably didn't just experience a sudden change of heart regarding its polystyrene use, though. Shareholder activist organization As You Sow has been pushing the fast-food giant to take a harder look at beverage containers and devise packaging recycling goals. Over the years, As You Sow has brought this issue to light at major companies like Dr Pepper Snapple Group (DPS), Starbucks, Yum! Brands (YUM), Coca-Cola (KO), and PepsiCo (PEP). Gaining some traction at a massive company like McDonald's is a huge deal when it comes to improving practices all along consumption and supply chains. The Humane Society of America recently scored a victory when McDonald's pledged to engage with pork suppliers like Smithfield (SFD) about phasing out cruel gestation crates for breeding sows. Big companies can make really big changes for the good when they put their ingenuity to the test. If McDonald's can get polystyrene out of the waste stream -- and enable more recycling of its food and beverage containers -- it could reduce a heck of a lot of wasteful pressure on the planet. That would create a much Happier Meal. Motley Fool analyst Alyce Lomax owns shares of Starbucks. The Motley Fool owns shares of Starbucks, Coca-Cola, and PepsiCo. Motley Fool newsletter services have recommended buying shares of McDonald's, Starbucks, Yum! Brands, Coca-Cola, and PepsiCo. Motley Fool newsletter services have recommended writing covered calls on Starbucks and creating a diagonal call position in PepsiCo.